I’ve always had a soft spot in my heart for roses. My maternal grandmother’s name was Rose. My maternal grandfather created a rose garden in his back yard in tribute to my grandmother. I used to love to wander the garden and smell the different roses. My late father would bring my mother a single rose every Friday during their 52-year marriage. The day of his funeral, a Friday, David Ransom presented my mother a single rose at the memorial service to continue the tradition. 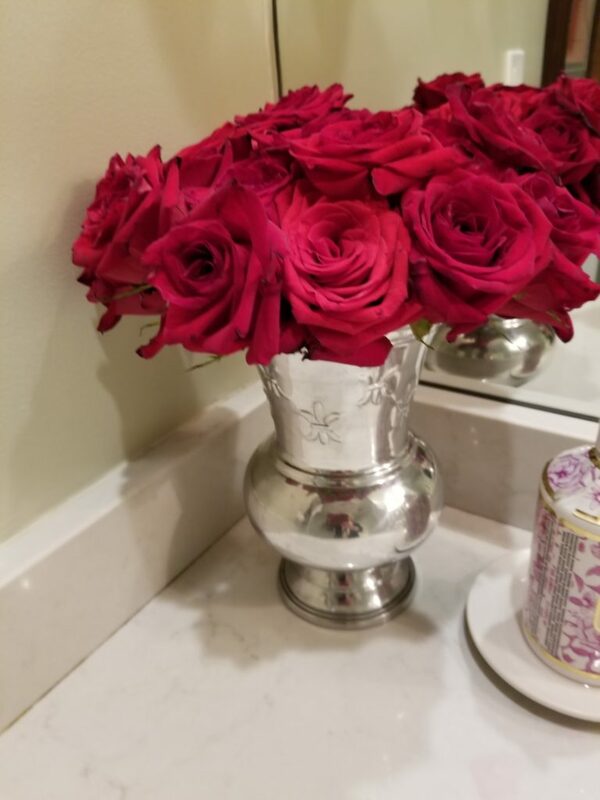 My mother always has a vase of fresh roses in my bedroom when I visit her in Tennessee. Roses are a symbol of love and, for me personally, for family and for heritage. A bouquet of red roses welcomed me to Kentucky at the 21C Museum Hotel in Lexington. Details make the difference! 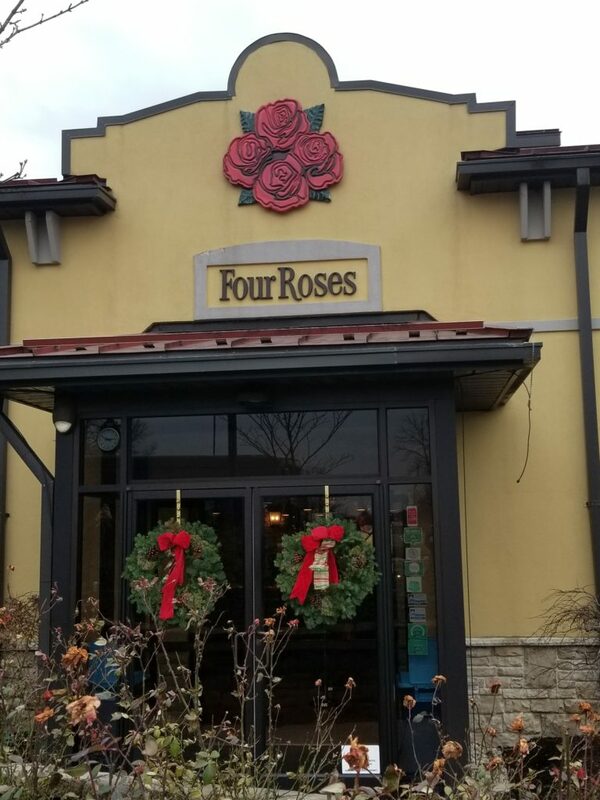 So, naturally I was intrigued by the story behind Four Roses Bourbon, which recently celebrated its 130th anniversary in 2018 by sending us a baby rose-bush to plant. Coincidentally, our garden had just three blooming rose bushes. Now, it has four rose bushes. I welcomed an invitation to visit last December. It was my first visit to a Kentucky Bourbon distillery. The legend of Four Roses Bourbon (est. 1888) started when its Founder, Paul Jones, a Louisville businessman, became smitten with a Southern belle named Mary, whom he courted for a number of years. Jones asked Mary to respond to his “final” marriage proposal (after a few asks) by wearing a corsage of four red roses to a cotillion dance. This time she accepted and entered the ballroom wearing the corsage. A medicinal bottle of Four Roses Whiskey on display in the distillery’s mini museum. 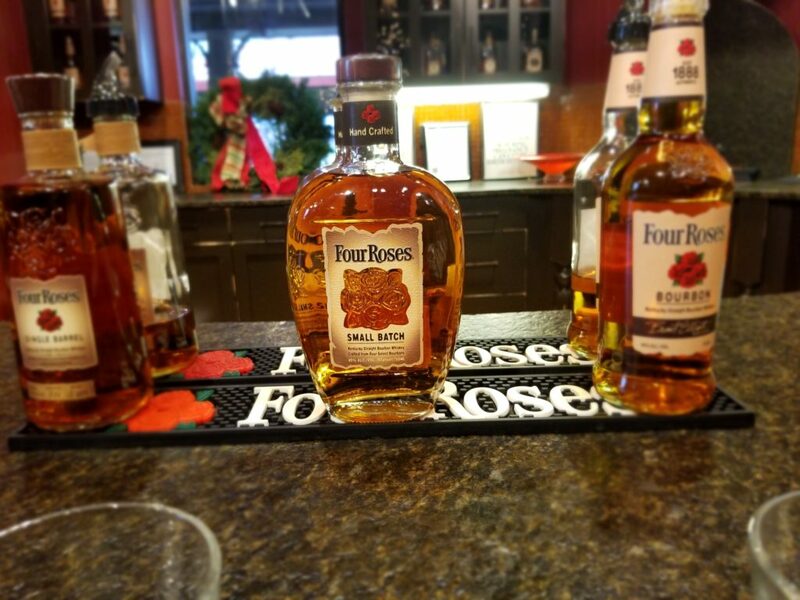 The word “return” is important because for a long time, Four Roses did not produce its Bourbon. One reason was Prohibition which lasted from 1920 to 1933. During that time whiskey was only approved and made for medicinal use. After Prohibition (Repeal) distilleries had to invest heavily to start over. Making Bourbon, is time intensive. In 1943, the company was acquired by Joseph E. Seagram & Sons, Inc., which reorganized it and decided to focus on making whiskies only for the export market. Then, the brand was acquired for a time by a consortium established between Pernod Ricard and Diageo. In 2002, Japan’s Kirin Holdings acquired Four Roses and reintroduced its flagship Kentucky Bourbons starting with its single barrel in 2004 and a small batch in 2006. 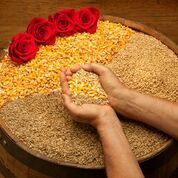 During a distillery visit last December Four Roses Master Distiller Brent Elliott guided us through a tasting and explained the process to which utilizes two mash bills and five propriety yeast strains to make ten distinct recipes used in the blending. It was a lesson in chemistry as he showed how the different proprietary yeasts are coded and then blended (V-delicate fruit, K=light spice, O=rich fruit, Q=floral essence, F=herbal). 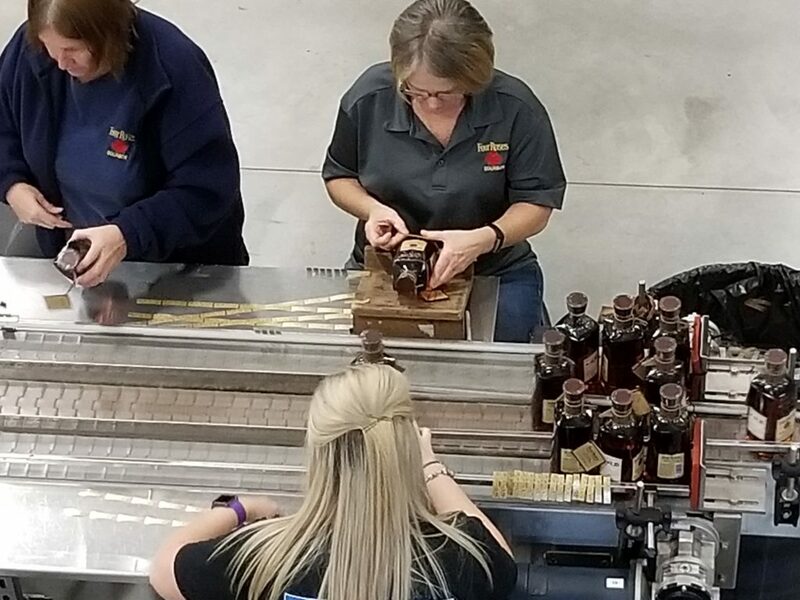 Workers on the Four Roses Bourbon bottling line applying labels by hand. We had the chance to visit both the distillery in Lawrenceburg and the bottling facility on Cox’s Creek to experience production from start to finish. We were intrigued by the bottling line with staffers applying labels and bottle tags by hand, each bottle carefully inspected. Talk about hand-crafted! 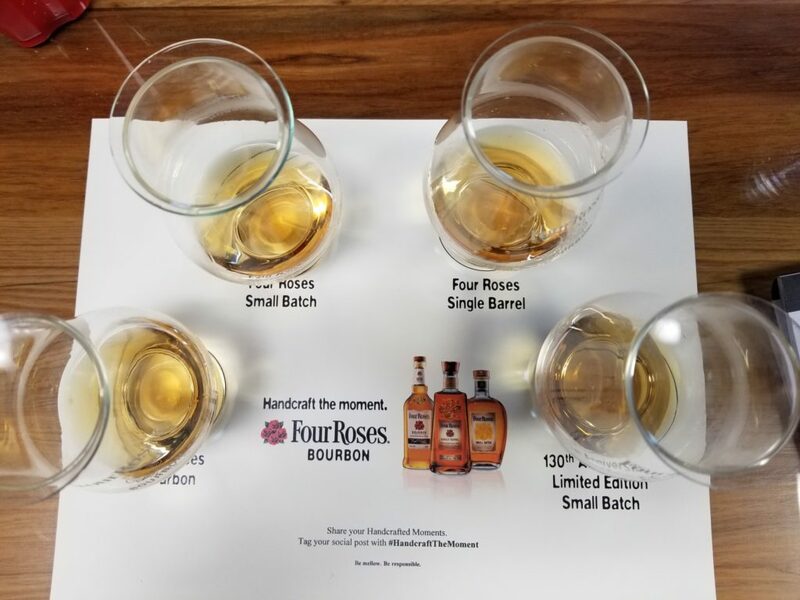 Four Roses has three signature Bourbons. All were smooth, mellow and delicate on the palate. 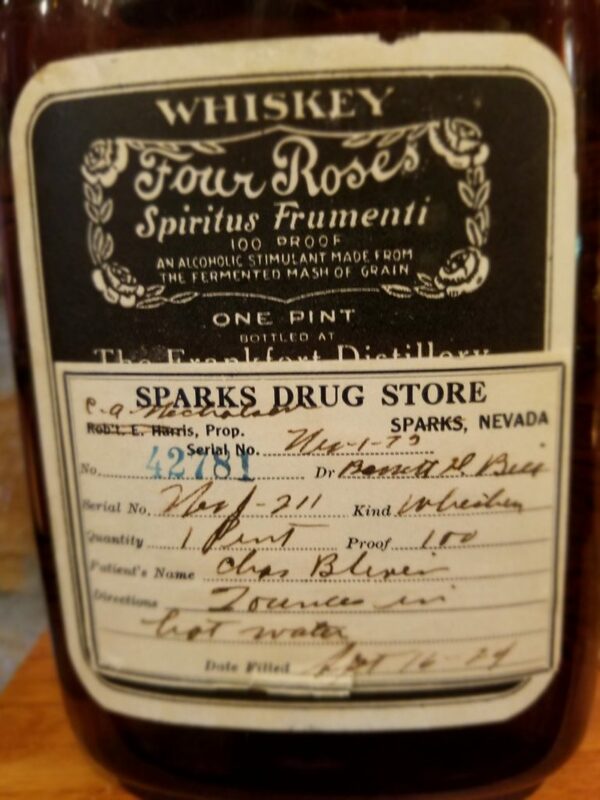 We also tasted a special blend 130th Anniversary Four Roses. This limited edition Bourbon was lightly floral and a tad sweeter in a very satisfying – please, give me some more!- way. Then, Elliott took us into his laboratory where we had the rare chance to taste of few other proprietary blends. Swoon! The distillery was decorated for Christmas when we visited in early December. 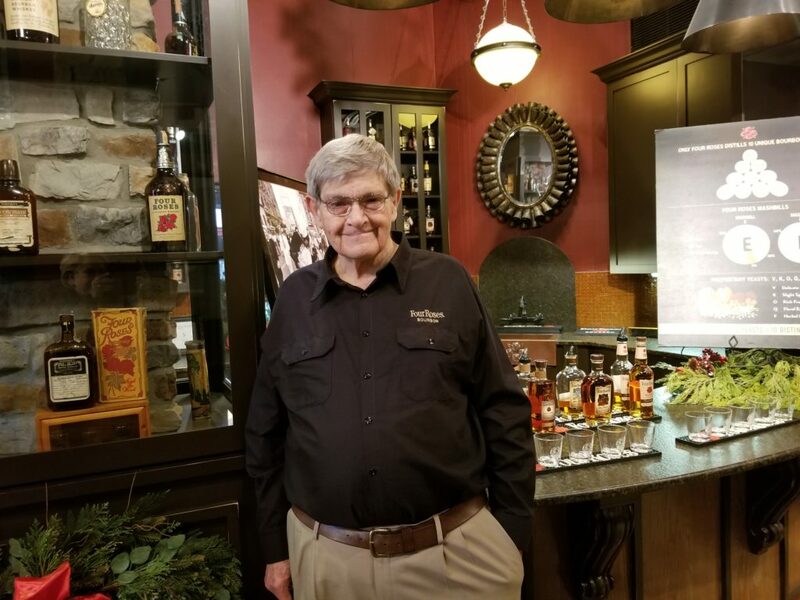 Al Young in Four Roses Bourbon’s mini museum at the Lawrenceburg distillery. 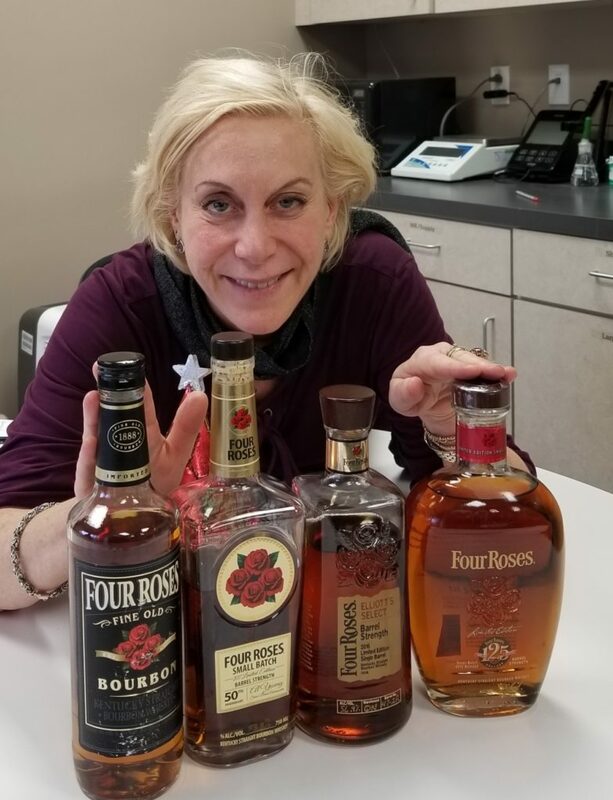 A special thank you to Four Roses Bourbon for hosting this trip and to The Baddish Group for including Melanie, a dedicated Bourbon drinker and rose lover. Tasting Master Distiller Brent Elliott’s special Bourbons in his lab.